Your friendly Thai education group! During our time in Thailand, our group has learned about different teaching strategies and the Thai education system through observation and experiences. Ally Rock chose to focus on education in Thailand because she is interested in comparing special education here to what it looks like in America; she is also interested in learning more about the laws and legislation that Thailand has to support students with disabilities. 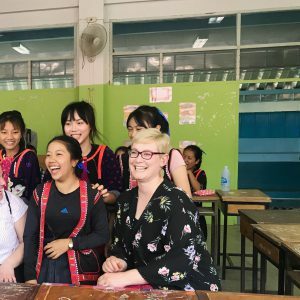 From our experience at the local schools, Ally has learned more about the systems in place to support students with disabilities and has been able to compare and contrast the Thai and American education systems. Kathryn Hyams was drawn to this group because she is continuing her education in a Master of Elementary Education program next fall. She is interested in comparing and contrasting the Thai and American education systems. Something that surprised Kathryn in the schools we have toured is the innovative curriculum and techniques that are used in the Thai school system. Kendall Garvey is interested in learning about education abroad to observe how people in rural areas and villages have adjusted to globalization and the growing global education system. One thing she took away from the experience at the local schools is the energy and passion many students possess for different subjects. Mel Leftakes is interested in education and human development in general. Human development stems from education, so she wanted to look further into what children get out of their education and how it leads to their future development. One takeaway she had from the villages was what they are able to focus on specializing skills through some tailored curriculum, rather than taking prescribed, general courses. Megan Herzog is interested in studying education because of her background in language teaching particularly in teaching the English language to students as a second language. She believes seeing how the Thai schools implement English language curriculum into their structure while still trying to promote balance between cultures has been very interesting. 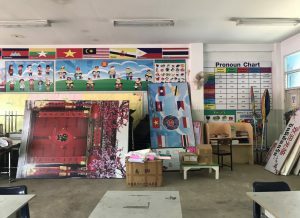 One thing that surprised her was how the students coming to schools from hill tribes are able to balance their multilingualism, learning both English and Thai to market themselves in modern Thai society, with their traditional and cultural heritage. Coming to Thailand from halfway across the world, we are noticing how small the world really is and how much we can learn from one another. We are using this opportunity to explore differences and similarities in the educational systems in America and Thailand. Because of the global nature of this experience and our collective interest in education and human development we want to share what we have learned from our research and firsthand experiences in-country. When we arrived at the airport we were surprised to see that most of the signs were written in both English and Thai. While traveling throughout the country, we heard English referred to as an international or global language. English language is a required class in all Thai schools and has played an important role in Thai education since 1891 when it was first introduced (Darasawang, 2007). However, there is an issue with how schools typically hire their English teachers, especially in villages and schools based on volunteer efforts. 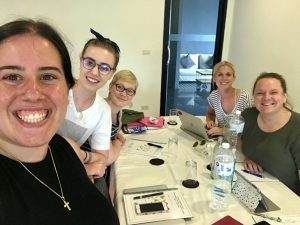 Many volunteer teachers, especially those native English speakers coming to Thailand from abroad, come into the system having only a minimal understanding of how English as a concept impacts communities and individuals. They are then expected to teach sufficient English but don’t necessarily have effective skills to teach the language in a sustainable and culturally empathetic manner. This causes the students’ learning experiences to be extremely repetitive and often damaging. We observed that many students at the Chiang Dao school were tri-lingual, being expected to learn both Thai and English, as well as hold on to their native tribal language, all while learning other necessary academic subjects. In classrooms that teach English, there must be a balance between promoting the students’ native cultures through activities and subject material and learning the background of English as a colonial language to become familiar with the history and culture of the language, as well as its global implications. An English classroom at the Chiang Dao Welfare School. Another aspect that really stood out to our group was hearing different areas of studies from the students of the Chiang Dao Welfare School. Many students were interested in studying tourism in the future. They informed us that this was a goal of theirs because the tourism industry in Thailand is very lucrative and will afford them the opportunity to provide for their families and communities in the future. We drew connections between the Thai tourism industry and our American hospitality industry. Like many other countries in the world, Thailand’s need for jobs in tourism and hospitality management is the fastest growing industry (Mahidol University, 2015). It is interesting to see how students are already choosing areas of study where they know they will have a secure job in the future. This could be influenced based on the school system, parents, or even through their own observation. This is in line with a collectivist society mentality, which prioritizes the greater good over individual aspirations. Looking at students from the villages, we learned that many children leave to pursue an education in order to access better-paying jobs. These jobs are typically found in larger cities, where these children get exposed to the dominant Thai culture but are expected to maintain their tribal traditions and values. This creates tension for these students, as they are being pulled between a more globalized Thai society and their traditional way of life. When we visited the Chiang Dao Welfare School we learned from the principal that they offer three main vocational programs in their school. Within the school, the students have the option to focus on different industries they are interested in and can potentially pursue a career in later on in life. Students can further their education and focus on subjects within the food service, agricultural, and mechanical industries. Students may pursue agriculture to support and provide sufficient business knowledge to help their families advertise their produce; they can also learn skills regarding farming, catching fish, and more. Within the mechanic education, students can learn exemplary skills regarding woodworking, welding, and construction. The principal of the school mentioned one of the main reasons they implement the vocational education system is because of the quality gap between teachers and capital in the cities versus schools in rural areas. The government funnels a large proportion of education funds toward schools where students already have a high likelihood to succeed, which disadvantages smaller and more rural schools (Rattankhamfu, 2016). He stated the staff does not want to put pressure on their students to compete with students that are exposed to more resources and networks. However, many students choose to continue their education in a university. The American educational system has moved away from the vocational school system model, while many rural schools in Thailand persuade their students to follow these career paths. This is beneficial for students who are not planning on furthering their education in the cities. They receive a high school diploma and have a considerable amount of background information on topics that can help their villages sustain their way of life and potentially further their specified knowledge within those subjects. 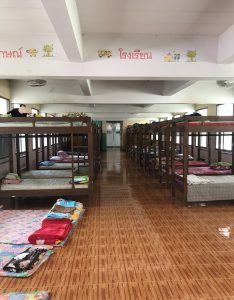 The girls’ dormitory at the Chiang Dao Welfare School. When we visited the Chiang Dao Welfare School in Chiang Mai we were lucky enough to see a demonstration from the elementary-aged students on an innovative curriculum approach called brain-based learning (BBL). In the video below, the students were practicing their multiplication tables in Thai. They would recite the numbers while hitting cups on their desk in a rhythmic motion. The children had memorized these routines of sorts, and the students nearest the walls were new to BBL and were just observing today. So, why BBL? The teachers explained to us that BBL is an effective educational approach because it combines physical movement with oral recitation, which helps the students retain information longer. It also injects more fun into the classroom and helps them get out energy, too! We were able to draw comparisons between BBL and a similar technique in the United States called total physical response (TPR). TPR also combines physical movement with mental exercises. TPR works to simulate the experience of a young child using observations, such as sights and sounds, to make cognitive connections (TPR Teaching System, 2013). This approach then helps children grasp educational concepts more naturally. It was an unexpected observation that the Thai classroom incorporated such innovative and creative learning techniques. Anecdotally, we were informed that there is also a lot of rote memorization and more traditional teaching approaches, so seeing BBL was very exciting. Chiang Dao is also a welfare school, which means that it is government funded. All of the students who attend the school must have families that make an income below a set poverty line. While the school’s staff was self-admittedly underpaid and resources could be hard to come by, they were still unquestionably dedicated to the children and their quality of education, which was highlighted through this new, modern approach to learning. Kathryn with Lahu and Lisu students at the Chiang Dao Welfare School. While observing several different schools that served different cultural groups, all of them appeared to have a common theme regarding students with different abilities. When asking the various schools about their programming for children of varying abilities, many responses said that most schools cannot accommodate diverse ability levels due to a lack of resources resulting in many students being sent to specialized schools in major cities to receive necessary supports. Students who are Thai and need specialized services are able to attend government-funded schools while non-Thai students needing special education services typically attend international schools in larger cities (Chambers, 2012). One of the main differences we observed was that the Thai educational system did not appear as inclusive to students with different learning abilities as the current American educational system. In the United States, students in special education are required to be in the least restrictive environment when appropriate. Many of the schools we visited were not as physically accessible as schools in the United States, too. In the U.S., accessibility features are required by law in public places. These features make education more accessible to students with different ability levels and limitations. One example that is found in the U.S. are ramps to enter buildings. At the different schools we visited in Thailand, many of the buildings were only accessible by stairs. In Thailand, the education system is making great strides towards being more inclusive of students with disabilities in the mainstream classroom but still has a ways to go toward reaching full inclusion. Throughout our time in Thailand, we have been exposed to many aspects of the education system. We will continue to observe and investigate further similarities and differences between the American and Thai education system and are looking forward to visiting more schools in the coming days! Chambers, A. (2012). Thailand Takes First Steps On A Long Road To Inclusive Mainstream Education. Retrieved from https://www.theguardian.com/global-development/poverty-matters/2012/mar/27/thailand-first-steps-inclusive-education.